COG displays (Chip-On-Glass) are monochrome, passive-matrix LCDs. They are classified as a graphic or character displays that can demonstrate information in a dot matrix pattern or as text. 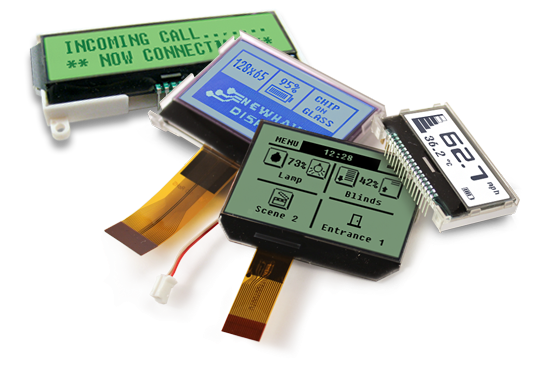 Unlike typical LCD modules, COG displays are designed without a PCB. Instead, the LCD's driver/controller is directly bonded to the glass of the display. This allows COG displays to be smaller in size, more cost effective and a highly customizable display solution compared to typical LCD modules. COG LCDs are composed of two pieces of polarized glass. On the non-polarized side of the glass, a special polymer is added to create grooves that run in the same direction as the polarizing film. Once this is done, a liquid crystal material is added to the grooved side of one of the polarized glasses. These grooves align the liquid crystal with the glass. The second piece of glass is placed on top with the grooved side in, aligned perpendicular to the first pieces of glass creating a row and column arrangement. The LCD driver/controller is then mounted directly to the LCD glass by bonding the gold bumps of the IC to the indium tin oxide (ITO) tracks on the glass.